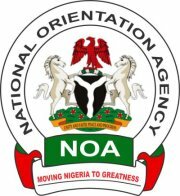 National Orientation Agency Urge Nigerians to collect their Permanent Voter Card – Royal Times of Nigeria. In view of thousands of Permanent Voter Cards, awaiting collection at the Independent Electoral Commission’s offices nationwide, concerned Nigerians have again been encouraged to troop out enmasse to INEC offices to collect their PVCs, as it remains the prerequisite for participation in the voting exercise during the fast approaching 2019 general elections . The patriotic call was made by the duo of Mr Olusegun Adeyemi, NOA Kwara State Director and Alhaji Mohammed Sabi, the Hon. Commissioner for Information and Communications Kwara State when the National Orientation Agency paid a courtesy call to the commissioner. The State Director Mr. Olusegun Adeyemi who was accompanied by other members of staff commended the Ministry and the Honorable Commissioner for being proactive since assumption of office and for demonstrating commitment towards the development of the State and Nigeria. Mr. Olusegun Adeyemi also harped on the importance of the National Symbols and the need to educate the public about placing high value on them because they represent Nigeria’s history and identity as a sovereign nation.